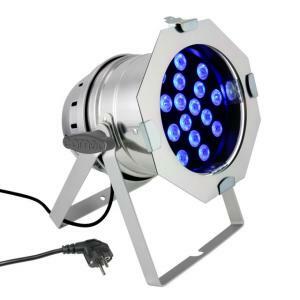 Ultra-high performance LED PAR 64 with 18 ultra-bright 3-Watt TRI colour LEDs in a silver housing. This high-performance LED PAR has a beam angle of 25 degrees and a power consumption of just 80 Watts. Like all new LED PAR cans, the CLP 64 TRI 3 WBS features a sturdy housing. The double bracket makes this PAR can the ideal lamp for use as a floor PAR or for mounting to cross-beams and bars. It is actuated either via the DMX protocol (3-pole XLR) with six control channels, in master/slave mode or standalone mode (sound control, colour change, solid colours). It features an integrated microphone and is quick and easy to operate using four buttons and an LED display.